​When it comes to appliance repair in Saugus, MA and beyond, people count on Edgeworth Appliance, your area experts in the industry since 1962. For more than 50 years, our service technicians have built our reputation on guaranteed labor and warrantee services. Need new parts for your appliances? We offer twice the warrantee manufacturers will offer you, providing a six-month warrantee on all parts, in addition to a guarantee on all our labor. If you have an appliance emergency, or any questions related to any appliances you own, give us a call today and see if we can't find you a solution. Do you have a refrigerator that just won't stop running? It's not a joke if it happens to you! Is your dishwasher not draining properly? Or, god forbid, has your coffee machine stopped working? If so, call David today at (781) 322-2953 or email us at info@edgeworthappliance.com with any further questions. Are you a senior? Don't forget to ask us about our senior discounts! ​Here at Edgeworth Appliance, we offer same-day service when we can and work at affordable rates - some of the lowest in the industry. 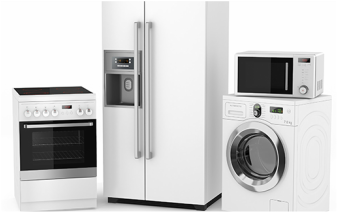 So if you want appliance repair in Saugus, MA or the surrounding area, give us a call today.